Good & Green is the sustainability strategy of the Godrej Group and was launched in 2011 to align business competitiveness and growth with social and environmental impact. At its root lies the idea that companies can help solve critical social issues while strengthening their competitive advantage. With the commitment to create an inclusive and greener India, Godrej Group recently hosted its Third Annual Good & Green Conclave on Waste Management in Mumbai, India. The conclave brought eminent leaders and experts together to deliberate and share their views on sustainable waste management practices. 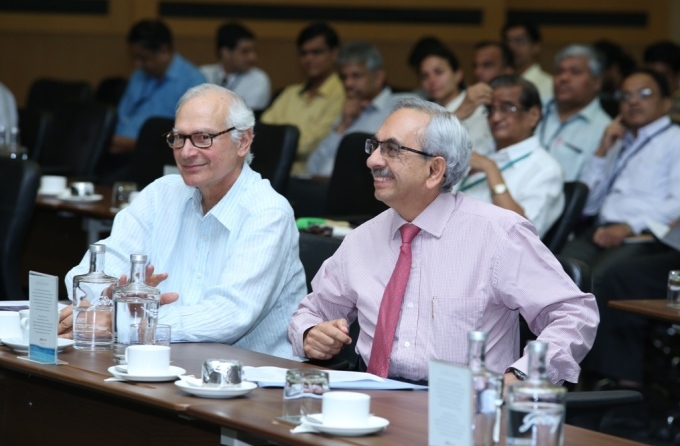 Mr. Jamshyd Godrej, Chairman and Managing Director, Godrej & Boyce Mfg Co Ltd and Mr. Nadir Godrej, Managing Director, Godrej Industries Ltd inaugurated the event with a welcome speech. It was followed by a series of panel discussions by industry experts on the changing needs of waste management. Decentralized waste management and waste to wealth remained the underlying focus of the Conclave. The conclave was attended by 250 people from stalwarts of the industry such as Vivek Agarwal, Chairman, ICWM, Anirban Ghosh, Vice President – Strategic Planning and New Business Development, Mahindra & Mahindra, Mukul Rastogi, Vice President, ITC, Chetan Zaveri, Vice President, IL&FS, Deeksha Vats, Sr.Vice President – Sustainability, Aditya Birla and also Ms. Bharati Chaturvedi, Founder Chintan, Ms. Jyoti Mhapsekar, President, Sree Mukti Sanghatana from the social sector. It was highlighted in the conclave that urban India is the world’s third-largest garbage generator with more than 45 million tonnes, or three million trucks worth, of garbage remaining untreated and disposed improperly. Concern was also shown towards the fact that only 68% of the garbage generated in the country is collected, of which only 28 per cent is treated by the municipal authorities. Various initiatives such as Swachh Bharat Abhiyan and the revised Solid Waste Management Rules are small steps towards achieving effective waste management. However, this could only happen when waste management & recycling activities are transformed into a National Movement by involving all stakeholders. Industries should aim for 3R concept and zero waste to landfill. Appliance division of Godrej located at shirwal, pune is the best and shining example of the same. Everyone should visit this plant. We are a non government developmental organisation working for the last 30 years for the rag pickers and other vulnerable communities. We have been working in the field of education, livelihood, environment, solid waste management, environment, cultural development, etc. We started solid waste collection from 2005 and we started collecting dry waste in the form of papers, plastic, pet bottles, beer/alcohol bottles, metal, glass, newspapers, magazines, tetra packs, cartons, broken wood, furniture and other types of dry solid waste. We are still collecting the waste from Cognizant, all the complexes of TATA Consultancy Services, Ecospace, Science City, HSBC Bank, Baisakhi Apartment to name a few. We get a well managed segregated dry waste and collected by our Rag Pickers whom we have provided them with uniforms and an identity card from the corporate houses. The waste is only collected when a huge quantity around 150-200 kgs or more is generated. Our Supervisor gets a call from the establishment and sends the team with the Goods mini truck to collect the waste. With the money generated after the waste is sold to the stockist/wholesaler, the funds are utilized for the social and economic development and emergencies of the rag pickers community. We aim to make this venture into a sustainable one but it’s only possible if we get a huge quantity of waste from corporate and business houses. Please ensure that the quantity of solid dry waste is more to make it feasible. We are requesting the civil society and the corporate, business houses and other housing complexes to segregate their waste and provide better livelihood opportunities to those who are the last tier of our society.